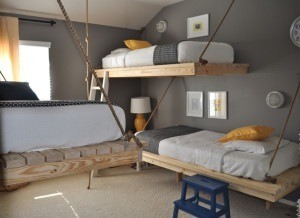 Ever since we found this floating bunk bed idea we’ve been looking out for more. We think hanging bunk beds are a great way to remodel a kids bedroom although they do require extra planning and DIY skills. Today we bring you a new floating bunk bed design, this time with a maritime theme! The great folks over at eastcoastcreativeblog.com were commissioned by a homeowner to design a pirate themed bedroom for their son. 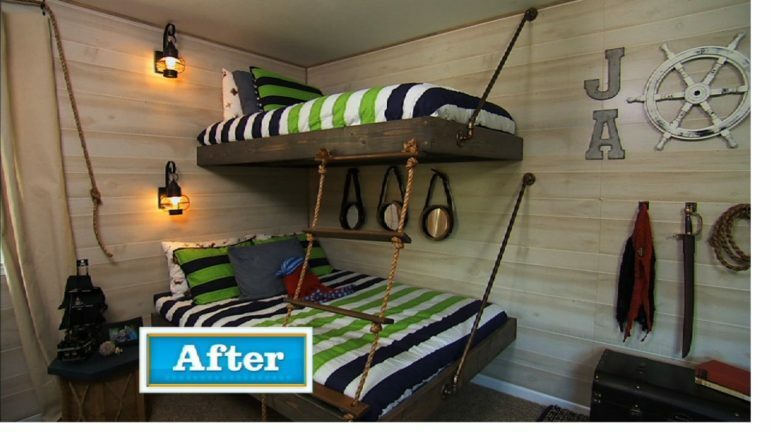 Crazy about swashbucklers and all things nautical, the young man also desperately wanted bunk beds in his room! 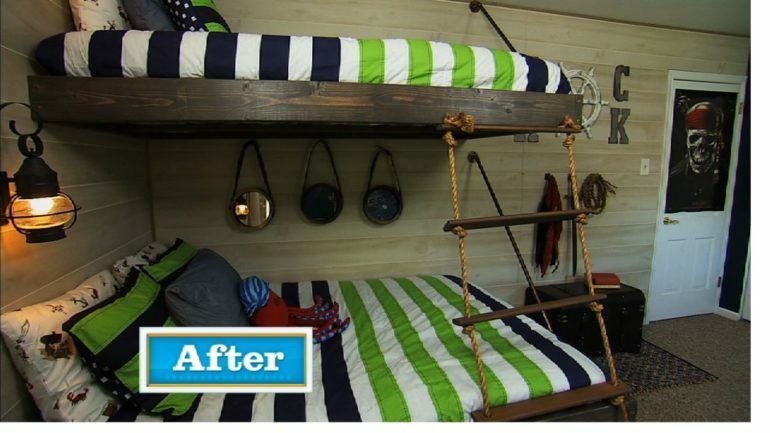 The challenge for the designers then became how to pull off the pirate effect without having to introduce heavy pre-made bunk beds into the overall makeover. They accomplished this by coming up with a plan to install floating bunks that would capture the flavor of sailing ship berths perfectly! Whereas traditional free standing bunk beds have plenty of built in support, floating bunks come with their own particular installation problems. In order to preserve the free floating effect that mimicked shipboard hammocks, there could be no framework or posts to support the beds, a double and a single. As related by Monica, East Coast Creative’s producer and designer (it’s also a tv show!) the solution came down to finding a way to anchor the beds to the wall as securely as possible with no visible means of support. Crafting the actual mattress frames for the bunks was a relatively simple process, all straight cuts in sturdy 2×8” pine boards produced simple box frames with slats across the width to support the mattresses. The 1 x3 slats were secured to the box frames with regular screws, but the frames themselves were held together with RSS (Rugged Structural Strength) screws. This was mandatory to keep the bed frames holding up under the twin forces of gravity and the boundless energy of a young boy. Once the frames had been stained, it was time to attach them to the walls. In order for the beds to be fixed securely, it was imperative to secure them to wall studs and once again, the heaviest load bearing RSS screws were used in the attachment. That made the bed secure on two sides, but left a problem of the “floating” corner of the double (bottom) bunk. In order to preserve the floating effect, an ingenious solution was found involving a pipe and two flanges. On the wall side the pipe was attached to a wall stud, on the floating side, it was secured with the second flange to the bed’s frame. The pipe was effectively hidden by the frame and provided ample support to the otherwise seemingly unsupported corner of the bunk. Attachment of rope “supports” completed the nautical effect, as did a rope ladder. Combined with other elements in the bedroom remodel (detailed elsewhere on the blog) the pirate ship effect was magnificently realized, transforming a standard bedroom into ships quarters that even Captain Jack Sparrow would be proud to use!